I am spending the month of January at La Muse, a writers’ and artists' retreat in a restored Cathar mansion in the village of Labastide-Esparbairenque (permanent population about 50), in the mountains near Carcassonne, France. Labastide could almost qualify for the Blue Zone appellation: the older generation of villagers lives to nigh on a century, tending their plots of land contentedly, producing enough fruit and vegetables for their needs. I was told of one villager, M. Gaston, who lived this traditional life. He had raised a wild sow he called Zoe - orphaned by the hunters who converge on the mountains in the open season - as a pet. Zoe lived a long, healthy life and eventually died of old age. When M. Gaston became a widower, he continued to care for his wife's pet rabbit, a well-fed bunny which attained a legendary size, until that, too, died of old age; whereupon M. Gaston transferred the grief he still felt at his wife's passing to the loss of her pet. He neglected to shave and wore a black armband, but continued to tend his apple trees, his pride and joy, with the love he had lavished on the rest of his ménage. Then, at the age of ninety-six, M. Gaston was struck down by Parkinson's disease. Although he is well cared for, he is unable to do what made life worth living: nurturing his family, his pets, his vegetable garden and his apple trees. 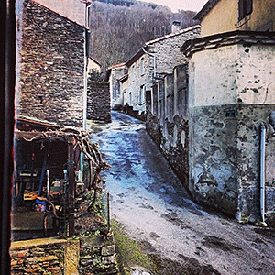 The villagers of Labastide set great store by their way of life, and wouldn't change it for the world. 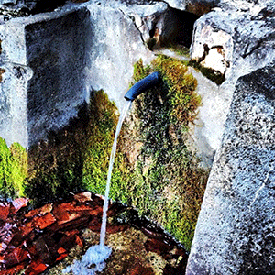 Every day, we writers on retreat fetch our drinking water from the village spring. Although the tap water is potable, the spring water is better than any money can buy, and it's free. The sounds of water flowing are part of the soundscape - the song - of this village. Rivulets course down the mountainsides to the stream that rushes along the valley floor, traversed by many rustic foot-bridges. There are no commercial outlets in Labastide, although you can buy eggs, onions and other vegetables in season from M. Garcia, a vigorous octogenarian, and M. Dektor sells local honey from the hives you can see up on the mountainside, among bare woods of chestnut, oak and beech, interspersed with groves of dark green spruce and a few umbrella pines. Madame Clotilde sells rabbits that she raises for the table, although I certainly shan't be buying those. However, the village is well served on alternate weekdays by a butcher's van, a baker's van, and an épicerie (grocer's) on wheels - a marvel of comprehensive compactness selling a range of fresh vegetables and fruit at better prices than in Carcassonne, as well as groceries and delicatessen products. Once a week our host drives us (five writers on retreat) to Carcassonne for additional provisions, which are transformed into meals in a large, cosy, well-appointed kitchen. Stoves and central heating keep us warm, though in fact the weather is quite clement, and I've noticed rosebushes in some gardens in unseasonal, full bloom. At the foot of our mountain is another small village, Roquefère, with a chateau and 12th-century chapel owned by a notary who works in Guadeloupe, and a Michelin-listed auberge, Sire de Cabaret, whose proprietor, M. Didier, also runs the adjoining buvette-saladerie, La Fénial, a diminutive cubby house containing just two tables, its walls lined with produits terroir: jars of fruit confiture; terrines, patés; local wines. 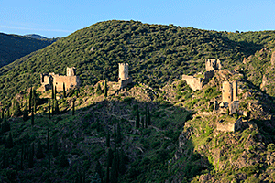 In this charming ambience, dwarfed by the grandeur of the mountains, M. Didier serves a variety of delectable refreshments, while the stream from Labastide, augmented by its hidden tributaries, rushes past nearby under arched stone bridges. Walking to Roquefère along a road high above the valley, you are suddenly greeted by a vista of the distant Pyrénées, the snow on them gleaming like marble, and you are reminded that the people of this region are resilient. Honouring long-standing tradition and their Cathar forebears, the local resistance fighters of 1939-45 - the montagnard partisans - were prepared to forfeit their lives in defence of what they held dear. La Muse is an ideal setting for a retreat, but the people who live in Labastide are not so much in retreat from the world as in their own microcosm with its own bucolic rhythms: a sustainable environment they work steadily to maintain. Even so, there is more in Labastide than meets the eye, including two English playwrights who live here permanently and a Tahitian family that owns a holiday home on the mountain. 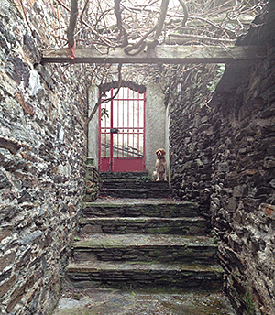 When I arrived, four young songwriter-troubadours from England and Wales were in residence, using La Muse's private chapel to try out new songs, and making music on the hillsides, so that the melodies seemed to issue from the trees. I'm told that some artists return again and again, and even buy houses in the village as places of personal retreat, where they can embrace the purposeful sense of peace that pervades Labastide-Esparbairenque, and devote their time and energies to their creative work.